Use high-yield toner for less cartridge changes. Manufactured with quality control standards. 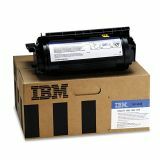 InfoPrint Solutions Company 75P4303 High-Yield Toner, 21000 Page-Yield, Black - Toner cartridge is designed for use with the InfoPrint 1332, 1352 and 1372.